Artists, writers, fans, and friends are expected to flock to Jesse James Comics on Saturday, August 27, to celebrate the store’s second anniversary and the expansion of the shop. 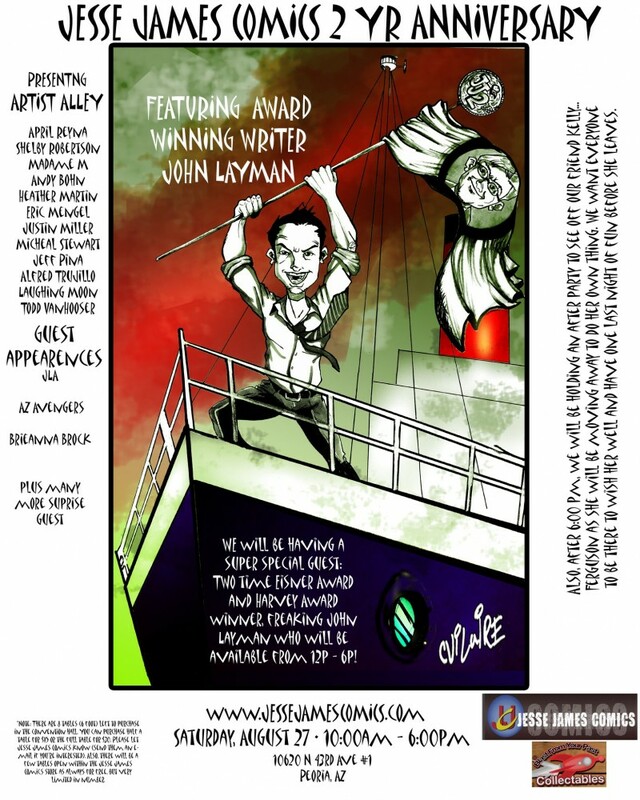 Award winning writer, John Layman (Chew) will be on hand (from 12-6), as will many other comic creators, including contributors to the much ballyhoed Unite and Take Over: Stories Inspired by the Songs of the Smiths”. Visitors will be able to see artists at work at a packed artists alley and purchase commissions and prints during the event. Superheroes and Villians will be on hand as well, as the party is joined by members of the Justice League of Arizona and Arizona Avengers. Spokesmodel and Geek Girl extraordinairre, Brieanna Brock and actress Victoria Paege will also be making appearances at the event. Store owner, Jesse James Criscione recently announced that the store will be expanding from its current 3,000 sq. feet to 6,500 sq. feet. The new space will be used to accomodate “mini-Cons” and other special events. This entry was posted on Tuesday, August 23rd, 2011 at 2:22 pm. It is filed under Comics, Libbi Rich. You can follow any responses to this entry through the RSS 2.0 feed.